Our journey begins in Paris, after a long 24hr flight we arrived in Paris at 1.30pm Monday afternoon jet lagged we made our way to Hotel Pavillon Opera Paris. After we had settled in, decided to do some exploring and shopping Paris has so many wonderful places, delightful cafe’s and shopping! We made our way to La Fayette plaza its just amazing with multi story levels of the most beautiful stain glass ceiling. I found Chanel perfume the largest in Paris! Back to our hotel room for a quick shower and a lovely dinner I had French onion soup it was delicious! 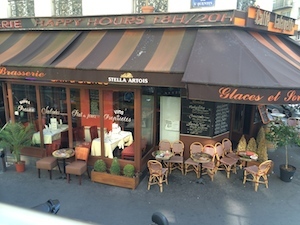 I just love the little cafes in Paris, wine, cheese and bread for every meal. Early night the next day we decided to take the open air bus and see the sights of Paris we visited the Louvre, saw the Mounlin Rouge and other great sights.